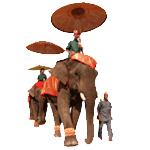 Follow in the footsteps of old Indochina. We offer tours connecting Laos, Cambodia, Vietnam (for Vietnam, circuits are not yet available on the Internet, but we can do it on request). From Laos to Cambodia discover the remains of the old Indochina. Forests, cruises, sumptuous and mysterious temples, waterfalls, meetings, while the program is to make your trip memorable.